Sebastian Vettel leads Kimi Räikkönen in a Ferrari one-two at the Hungarian Grand Prix after a thrilling qualifying shootout. It was the Scuderia’s second one-two of the season, with Vettel finding a 0.168-second edge over Räikkönen in the top-10 shootout. 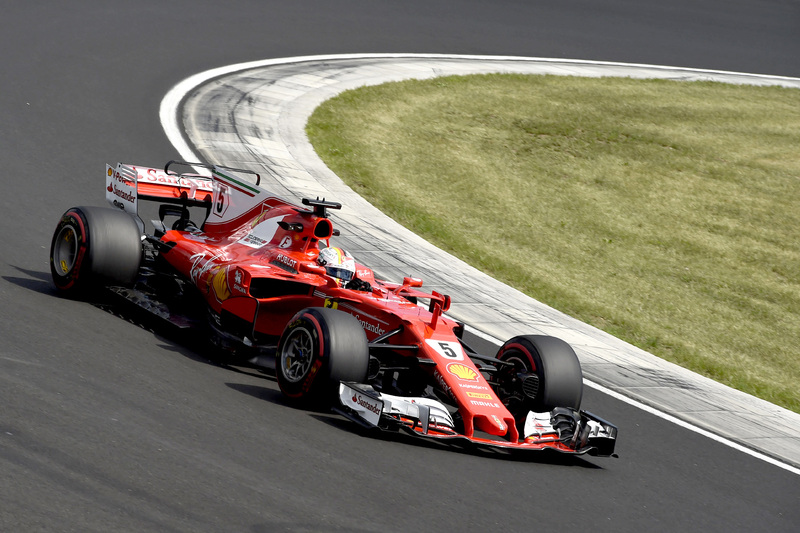 As a sign of how fast the 2017 cars are compared to those of yesteryear and how well hooked up the Ferrari is at the Hungaroring, Vettel’s pole lap — a 1 minute 16.276 seconds — was more than two seconds quicker than the previous lap record set in 2004. “To have the car in the right window, to have the sun shining, to have people around, that what it’s about,” Vettel said. The German noted that many had begun doubting Ferrari’s title credibility after a weak weekend at Silverstone, but he said the team’s results would speak for themselves. “I’m very happy with where we are as a team,” he said. Räikkönen, who has come under pressure numerous times this season for his inability to match his teammate’s pace, said he felt he had the pace to beat Vettel to pole. “The start was good and the end was not too bad, but at the chicane I braked on the outside kerb and it got loose,” Räikkönen explained. The Finn added, however, that he could be optimistic for a good race on Sunday. “I managed to improve my car for the qualifying, and we must say we’re happy with how it’s handling now. Mercedes, traditionally the strongest qualifier, had no answer to Ferrari’s pace, with both Valtteri Bottas and Lewis Hamilton struggling from Friday practice to find balance in their machines. Hamilton struggled in particular, just as he did at the similarly slow Monaco Grand Prix. He complained of vibrations from both sets of his qualifying tyres, even abandoning his first flying lap after running wide. Bottas was left to lead the charge, but the Finn could get to within only 0.254 seconds of Vettel’s pole position time, leading a Mercedes three-four start on the second row of the grid. The Finnish driver noted that his team was still struggling to get the most out of its car on slow tracks. “We’ve still got work to do at circuits like this,” he said. “This weekend we can see we’re not performing as we want. Red Bull Racing was let down to finish fifth and sixth after hinting at pole-challenging pace on Friday. Daniel Ricciardo, who seemed a step ahead of his teammate on Friday, suffered a hydraulic problem during Saturday morning practice that put him on the back foot for qualifying. Max Verstappen was able to get a jump on the Australian by the end of the day with a slim 0.021-second margin, but the pair was more half a second behind pole. Nico Hülkenberg won the tight battle to be the best of the rest, though the Renault driver’s best lap time was 1.192 seconds slower than the pole position time, underlining the gap between the front-runners and the midfield. Hülkenberg, however, will take a five-place grid penalty for an unscheduled gearbox change, dropping him to twelfth. Perhaps more impressive than Hülkenberg’s lofty qualifying position — tipped to become a more regular occurrence since the team’s heavy car revisions at the British Grand Prix — was that Fernando Alonso put his McLaren-Honda less than 0.1 seconds behind in P8. The slow and twisty Hungaroring circuit takes the emphasis away from engine power, allowing McLaren’s chassis to pull the car up the grid. Alonso’s teammate, Stoffel Vandoorne, qualified in ninth place, 0.4 seconds ahead of Toro Rosso’s Carlos Sainz. The battle to make it to the top 10 was tight, but Q2 was defined by underperforming teammates. Nico Hülkenberg ended the session in sixth for Renault, but his teammate, Jolyon Palmer, was 0.8 seconds off his pace and qualified P11, just 0.1 seconds outside of Q3. Toro Rosso’s Carlos Sainz was the driver who beat Palmer to a Q3 berth, but his teammate, Daniil Kvyat, was 0.2 seconds further back in P13 — though Kvyat picked up a three-place grid penalty for blocking Lance Stroll during Q1 and will start P16. Splitting Palmer and Kvyat was Esteban Ocon in P12, who put a 0.2-second buffer to his Force India teammate, Sergio Perez, in P14, who in turn bested Romain Grosjean’s Haas in P15. Felipe Massa’s withdrawal from the weekend with an apparent ear infection and Paul di Resta’s call-up to replace him dominated the lead-up to Q1. The Scotsman had no preparation before entering qualifying — Massa pulled out after Saturday morning practice — but improved enormously throughout the 18 minutes of Q1. The Williams car has been uncompetitive at the Hungaroring all weekend, but di Resta acquitted himself well — he qualified P19 ahead of Sauber’s Marcus Ericsson and just 0.7 seconds behind teammate Lance Stroll in P17. Pascal Wehrlein split the Williams pair in P18, and Kevin Magnussen sneaked ahead to P16 by 0.007 seconds.